So....I have the desire to update my blog often but it doesn't always work. I have tons of the cutest pictures ever but most of them won't make it on here because I am too lazy to upload them. I know right? There are no excuses. Jess came last week to hang out with me. It was so much fun. Her baby is the same age as Jackson. They actually played well together. Jackson stole all the toys from Jaden. I kept hoping he would steal them back but it didn't happen. Sad. While she was here, she let me use her camera. Her fancy one. I decided for sure that I am going to be a photographer when I grow up. Here are some of my photography skills. I know right? Amaaaazing. Just kidding. But I did LOVE taking pictures of nothing. It was so fun. That's an amish farm by the way. I think. Or maybe not. BUt we were in amish country. I came up with this quote that describes our trip perfectly. 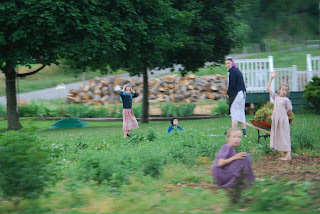 "Our Hollywood is the Amish country and we are their paparazzi." We spent a bunch of time sneaking pictures of them. We saw amish on scooters, amish with weedwackers, amish at Wal-Mart etc... How cool is that? We almost died a few times trying to capture the perfect moment. But it was all worth it. Here is the proof. I am a good housewife and made cookies today. I know right? Thanks mom, for the recipe. I love them. Well it's time for me to go now, I am going to eat chicken with Janell. And probably carbs. Because I can and she can't. Isn't that mean? Yes it is not fair. Just don't tell me when you eat anything with white flour. Can I have a bite of everything you eat?